With the consultation process over the future of freshwater management well underway, New Zealanders need to know what is being planned. The main way to keep informed about NZCPR's campaign is to ensure you are registered for the free weekly newsletter of the New Zealand Centre for Political Research HERE. NZCPR will update readers about the campaign on a regular basis. You can see first hand what iwi are pushing for by visiting the Iwi Chairs Forum website and reading their reports on the ownership and control of freshwater HERE. 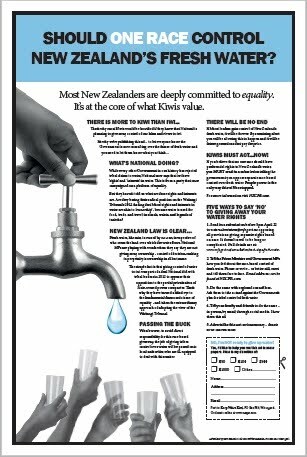 NZCPR are running an on-line petition on the ownership of water – you can view it HERE. Email MPs and councillors and let them know what you think about the ownership and control of freshwater.